How Does the Stock Market Trading Floor Work? How Does the New York Stock Exchange Work? Reporters break financial news against a backdrop of the stock exchange. Harried floor traders shout and gesture to complete their transactions. These scenes present a compelling view of the stock exchange. Certainly, when significant events happen -- an unexpected profit announcement or a government release of major economic news -- activity heightens. The trading floor is much quieter than it was before Internet trading. Before the widespread application of electronic trading, executing a trade on the floor of the exchange was a labor-intensive activity. A trade originated in a broker's office somewhere in middle America when an investor told his broker to buy 100 shares of XYZ Corporation. The broker wrote the buy order on a form and gave it to his wire operator, who promptly sent it to the brokerage firm’s desk on the floor of the exchange. A runner took the order to a trader in the pit where the stock was traded. The order was executed through open outcry and hand signals. The floor trader then gave the order confirmation to the runner, who returned it to the brokerage firm’s station. The confirmation was wired back to the local office, and the trade was completed. Before wire transfers of money became commonplace, investors had seven days to pay for their purchases. While the volume of shares traded has mushroomed in the digital era, fewer of those shares are being traded on the floor of the exchange. 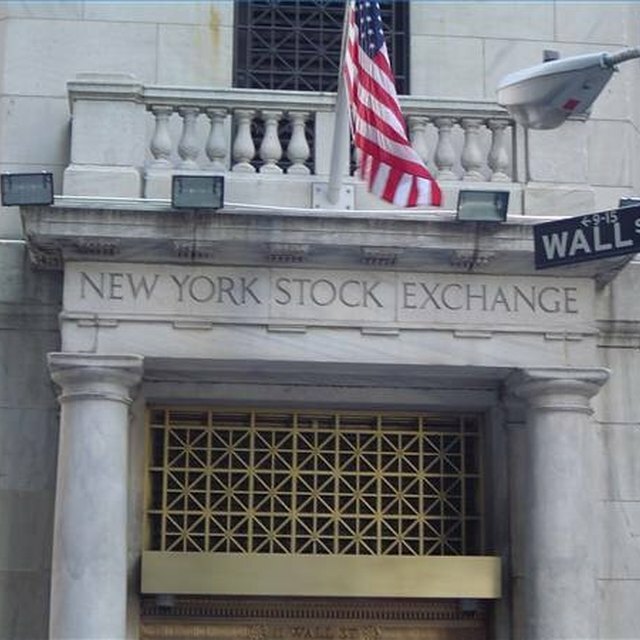 In fact, only about 12 percent of all stock transactions occur on the floor of the New York Stock Exchange. The presence of multiple computer monitors and relatively quiet trading bears testimony to this trend. The NYSE handles another 12 percent of the market volume electronically. The National Association of Securities Dealers Automated Quotation system, NASDAQ, accounts for almost 25 percent of the daily volume electronically, with the remainder of the trading volume -- over 50 percent -- accomplished electronically in the Over-the-Counter market. What Are Stock Trading Tickets? When Hurricane Sandy hit New York, the markets were closed for two days, although the NYSE didn't sustain damage. While trading was stopped, it could have continued even with the physical closure of the Exchange: The physical edifice is just not that important anymore. Today an investor can sit at a computer and have a trade for 100 shares of XYZ Corporation executed electronically in seconds through an online brokerage firm that may not be located in New York. The physical Exchange will continue to exist, but its role will continue to diminish, leaving it a symbol of America’s economic strength while the activity continues to boom in virtual reality. NPR: Why Does the Stock Exchange Need a Trading Floor? Online Stock Trading Review: What Does It Take to Work on the Trading Floor?